Article first published as Blu-ray Review: Kiss Me Deadly - The Criterion Collection on Blogcritics. 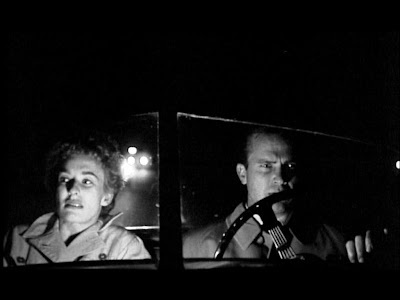 Some film noirs hint at the nastiness bubbling up underneath their surfaces; Kiss Me Deadly positively wallows in it. Robert Aldrich and A.I. Bezzerides’ 1955 adaptation of the Mickey Spillane novel checks the noir boxes—private eye protagonist, mysterious femme fatale, shadowy plot-advancing devices—but steps over and then obliterates the line with its brutal depictions of violence and an unwavering amoral (at best) streak from its supposed good guy. Mike Hammer (Ralph Meeker) is a divorce PI cruising on the highway just outside Los Angeles when he’s confronted by a desperate woman (Cloris Leachman) who he nearly hits with his fancy sports car. He picks her up, only to discover she’s on the run from a dangerous group of characters. Fast forward a bit — she’s dead, and Hammer himself is about to be visited by a host of forces out for his demise. Naturally, Hammer attempts to discover the conspiracy at the heart of the hitchhiking woman’s murder and his own sudden popularity with the bad guys, but he bungles the investigation at every turn. Aldrich’s Hammer is a blunt force, blindly stumbling through his every encounter like a drunken man. He’s not benignly stupid either—rather, we get a cruel, violent, womanizing sleazebag. Consider his relationship with Velda (Maxine Cooper), his sort-of girlfriend he exploits to catch men in the act for his divorce business. Their relationship isn’t exactly a committed one, but his leering eye finds something it likes around every bend. His dubious intentions in picking up the hitchhiker at the beginning of the film become truly evident as he lecherously approaches a woman at a party (Marian Carr) during his investigation as well as the roommate (Gaby Rodgers) of the murdered woman. His violence crops up casually as well — perhaps most shockingly when he breaks a rare vinyl LP and slams a drawer on a man’s fingers in attempts to extract information. Like many a noir, Kiss Me Deadly relies on the presence of a MacGuffin to propel the story along — here, a mysterious object referred to as the Great Whatsit — but Aldrich doesn’t build toward a conclusion where the object becomes irrelevant, as with most MacGuffins. Instead, the object settles in front and center, where its terrifying properties push the film’s surreal colorings into a fully-fledged gonzo ending that plays like an explosive brew of science-fiction implausibility and Cold War paranoia. That ending — one of the greatest of all noirs and even all cinema — caps off a blistering 106 minutes of vicious unpleasantness. Wallowing in the sleazy film noir muck is rarely this fun. Kiss Me Deadly is presented in 1080p high definition with an aspect ratio of 1.66:1. The transfer here, sourced from a 35mm fine-grain master positive, doesn’t have the same black-and-white luminescence seen in recent Criterion Blu-rays of Pale Flower or Sweet Smell of Success, but that likely has more to do with the production of the film than the transfer. The film has a slightly rough-edged, down-and-dirty look to it that’s appropriate to the subject matter, so the images are rarely tack sharp. Edge enhancement has clearly not been misused here. Otherwise, the image is quite film-like with a persistent, but not troublesome grain structure and impressive amounts of fine detail, often seen in facial features. Grayscale separation is solid, although blacks rarely look inky and often register as more of a dark gray. Damage is minimal, with only very slight scratches running through some sections. All in all, the film makes a worthwhile jump to high def. Audio is presented in an uncompressed monaural track that doesn’t suffer any major hissing or crackling problems. Voices can sound a little harsh in spots, but intelligibility is never an issue. Criterion has assembled a nicely varied collection of extras for the film, which was previously available only in a barebones edition from MGM. First up is a short tribute from director Alex Cox, who discusses the film’s style and themes in his own idiosyncratic and entertaining way. A new video piece discusses the film’s iconic Los Angeles shooting locations and then includes a now-and-then comparison for a handful of scenes. Also included on the disc is the film’s very brief alternate ending, which was often the screened ending in theaters, contrary to Aldrich’s wishes. This truncated conclusion implies a very different fate for several characters. A new commentary by film noir experts Alain Silver and James Ursini was also recorded for this release. The theatrical trailer rounds out the disc. A film noir to end all film noirs, Kiss Me Deadly is a blistering, bizarre and essential film that has to be experienced, and this is the edition with which to experience it.